I always keep a bunch of hardboiled eggs in the fridge, and we always have a ton of avocados on hand. I love both, and I love 'em together (usually as part of my breakfast, but there's no reason you can't eat this any other time of day as a snack or side). 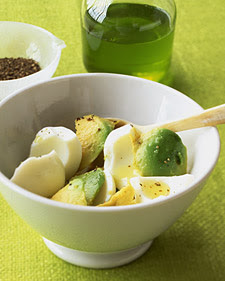 Put the egg and avocado in a bowl, and season to taste with salt and pepper (or a squirt of Sriracha chili sauce). It's fast, easy, tasty, filling, and good for you (yes, even the egg yolk). Plus, the clean-up's a breeze.